Homes for sale in Troon North in Scottsdale can be found in 5 luxury real estate communities; Candlewood Estates, Boulder Crest, The Monument real estate, Pinnacle Canyon real estate and Talus real estate. Situated adjacent to a 185-acre mountain preserve Troon North master planned community is more than luxury homes and world-class golf. The 37,000 square foot full service clubhouse features a bar and grill, locker rooms, an award winning golf shop and banquet, conference and catering facilities for parties up to 200. These exceptional amenities make the Troon North Clubhouse an incomparable asset to golfers and residents alike. 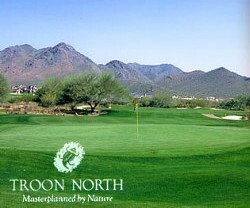 The golf club at Troon North is a public daily fee course; semi-private memberships are available.